The word "geothermal" is derived from the Greek words geo (earth) and therme (heat), and "energy" is defined as usable power, such as heat or electricity. The temperature at the Earth's core (6,437 kilometers or 4,000 miles deep) may exceed 4,980°C (9,000°F). Energy from the Earth's interior, in the form of heat, constantly flows outward. Upwelling of hot mantle material to shallower depths and lower pressure produces melting, forming a magma (molten rock) that is less dense than the mantle material from which it was derived. This less dense magma rises slowly through the mantle to the Earth's crust. If the magma reaches the Earth's surface, it is called lava. If magma remains beneath the Earth's surface within the crust, the heat energy is released slowly over time to the local and even regional area. This residual heat energy transfers to adjacent rock and groundwater , heating them to temperatures exceeding 370°C (700°F). Most of this heat energy remains stored in the Earth's depths, creating geothermal reservoirs. Some heat energy from the geothermal reservoirs transfers to deep-circulating groundwater, and the superheated water travels to the Earth's surface via faults and fractures, creating geysers and hot springs . High-temperature geothermal resources (temperatures greater than 150°C, or 302°F) are primarily found in volcanic regions and island chains, whereas low-temperature geothermal resources (temperatures less than 100°C, or 212°F) are found throughout the world and on all continents. Worldwide, high-temperature resources usually are found in tectonic settings associated with volcanism , such as the Pacific Rim (the so-called "Ring of Fire") * and in Iceland. In the United States, energy use associated with geothermal reservoirs takes place primarily in the western states and Hawaii, which are areas of geologically recent volcanism. From prehistoric times, humans have utilized the geothermal energy that flows freely from underground reservoirs to the Earth's surface. The Romans used geothermal water to treat various diseases as well as to heat the city of Pompeii. Native North Americans used geothermal water for cooking and medicinal purposes for more than 10,000 years, and the Maoris of New Zealand have cooked geothermally for centuries. Ancient records in Iceland mention the use of geothermal springs for washing and bathing. Generating electricity through indirect use. Most areas of the world are suitable for geothermal heat pumps; hence, there is a great potential for future worldwide use of heat-pump technology. Geothermal heat pumps take advantage of the fact that a majority of the Earth's upper 3 meters (less than 10 feet) maintain temperatures ranging from 10 to 15.5°C (50 to 60°F). A geothermal pump system consists of pipes buried horizontally in the upper 3 meters adjacent to a building and then tied into the structure's ventilation system by simply using the subsurface as a heat exchanger. A liquid passed through the pipes picks up residual underground heat in winter, then delivers it to the building, thus warming it. In summer, the liquid transfers heat from the building to the ground, thus cooling the building. Direct-use applications utilize groundwater that has been heated to generally less than 100°C (212°F). Direct use of geothermal energy can supply heat for industrial processes, and can boost agricultural and aquaculture production in cold climates by heating greenhouses, soils, and aquaculture ponds. Geothermal uses also include hot spring and spa bathing, as well as residential and regional (district) heating. Direct uses annually provide 11,000 thermal megawatts of power worldwide. In Reykjavik, Iceland, more than 95 percent of the buildings are heated with geothermal water pumped from deep wells. The city of Klamath Falls, Oregon (USA) heats 35 percent of all residential dwellings and also heats most downtown sidewalks in the winter. The Blue Lagoon near Grindavik, Iceland is a mineral-rich thermal lake created by the nearby Svartsengi geothermal power plant. The plant pumps superheated brine from 2 kilometers beneath the Earth's crust to supply electricity and hot water to the surrounding area, and discharges relatively "cooled" (but still warm) water to the lagoon. The turquoise blue, mineralrich waters of almost 40°C (104°F) are a popular tourist attraction. Some bathers spread silica-containing foam or mud on their skin. new. Wells are drilled into known geothermal reservoirs where temperatures often exceed 360°C (680°F). Steam or super-heated water is brought to the surface under its own pressure where the energy, in the form of steam, is utilized to turn the turbines of an electrical generator. Binary-cycle plants, which pass (in separate piping) moderately hot geothermal water by a secondary fluid with a much lower boiling point than water. This causes the secondary fluid to flash to steam, which then drives the turbines. Geothermal electric power generation is a proven technology that is significant in nations with no indigenous fossil fuel resources. Moreover, it is a renewable energy source and one that is considered cleaner than fossil fuel (e.g., geothermal power plants emit less carbon dioxide). Worldwide, geothermal energy produced 7,500 megawatts in 21 countries (mostly developing) in 2000, serving 60 million people. The United States produced 3,000 megawatts from geothermal power plants, supplying about 4 million people. Comparatively speaking, geothermal energy is more "environmentally friendly" than fossil fuels or nuclear fission. However, emissions of carbon dioxide gas and smaller amounts of hydrogen sulfide accompany the geothermal fluids extracted from wells. Moreover, hot brine liberated by drilling must be carefully managed to prevent environmental damage and potential human health impacts. The super-heated nature of geothermal fluids creates a hazard to animals and humans. 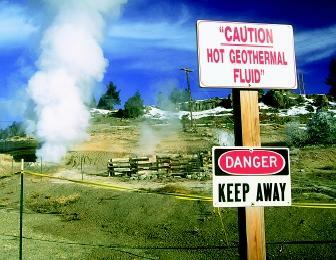 This sign at a geothermal power plant in California (sited on a geyser field) warns visitors to use caution. To prevent ground subsidence (sinking) caused by the extraction of geothermal fluids from their underground reserves, waste brines often are reinjected into the well. Reinjection must be done carefully to avoid contaminating potable (drinkable) groundwater supplies. Above-ground disposal of waste brine also must be managed to avoid contamination of seas and waterways. As more geothermal resources are exploited for their electricity-producing capabilities, it will become increasingly important to control carbon dioxide emissions and properly manage waste brines and other byproducts of mining and power production. SEE ALSO Earth's Interior, Water in the ; Fresh Water, Natural Composition of ; Fresh Water, Physics and Chemistry of ; Groundwater ; Hot Springs and Geysers ; Mineral Water and Spas ; Plate Tectonics ; Springs ; Volcanoes and Water . Putnam, William Clement. Putnam's Geology, 5th ed. New York: Oxford University Press, 1997. Duffield, W. A., J. H. Sass, and M. L. Sorey. Tapping the Earth's Natural Heat. U.S. Geological Survey Circular 1125 (1994). Harsh, Gupta K. Geothermal Resources: An Energy Alternative. New York: Elsevier, 1980. Geo-Heat Center. Oregon Institute of Technology. <http://geoheat.oit.edu> . Geothermal Education Office. <http://www.geothermal.marin.org> . Geothermal Energy. The World Bank Group. <http://www.worldbank.org/html/fpd/energy/geothermal> . Geothermal Resources in Iceland. District Energy Library, University of Rochester. <http://www.energy.rochester.edu/is/reyk> . Soulsby, David. North Atlantic Hot Spot: A Geological History of Iceland. Kibo Productions Ltd. <http://www.kibo-productions.co.uk/nahscript.htm> . The first power plant to utilize a geothermal well was brought online in Larderello, Italy in 1904. The first geothermal plant in the United States was at The Geysers in Northern California in 1962. These two geothermal fields are unusual because they emit dry steam, which is superheated steam with no associated fluids. This kind of steam is preferred over wet steam (the more common kind of steam found in geothermal fields) because it contains less corroding elements and less waste to deal with. * See "Volcanoes, Submarine" for an illustration showing the Ring of Fire's location. PNOC�Energy Development Corporation is primarily engaged in the business of developing and operating geothermal energy projects and geothermal power projects in the Philippines. EDC currently operates geothermal energy projects on the Philippine islands of Leyte, Luzon, Negros and Mindanao with a total installed capacity of 1,148 MW. PNOC�EDC is the sole active developer of geothermal energy and geothermal power projects in the country and at present accounts for approximately 60% of the total installed geothermal energy capacity in the Philippines. At present, our country is the world's # 2 geothermal energy producer - second to the United States.